Frequently, I hear wonderful phrases like: you’re so creative, you’re so artistic, and you’re so good with this artsy craftsy stuff. I weave, spin yarn, knit, crochet, sew, and a host of vintage needle crafts, but many would be surprised to find out I cannot draw. To say, I have the drawing skills of a five-year-old would be generous. This fundamental skill completely eludes me, and it’s an important part of the tapestry weaving process. In the past, I’ve used some cut and paste techniques, then laid down a grid to transfer and enlarge the image for a cartoon from which to weave. It’s been a huge stumbling block for me. 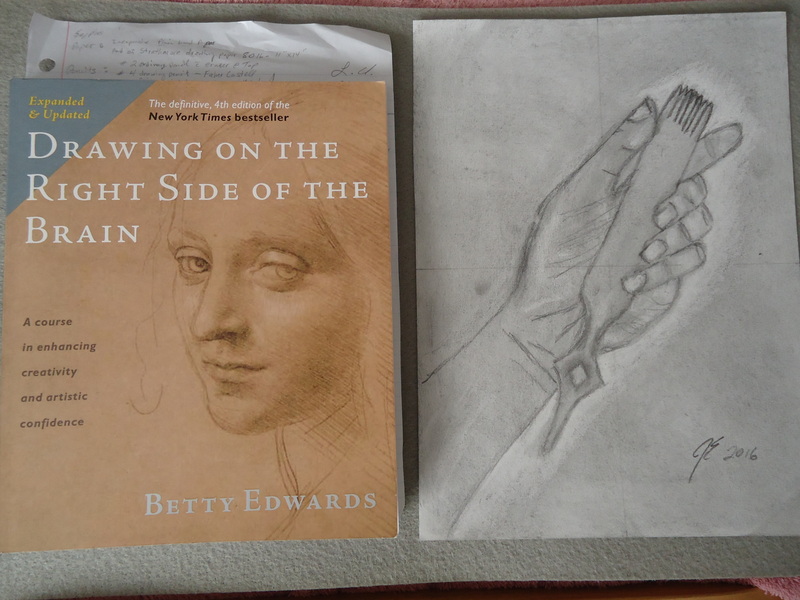 After confiding this shame to my weaving friends, there was a unanimous recommendation of the book, “Drawing On the Right Side of The Brain” by Betty Edwards. Amazon to the rescue, this book was reasonably priced and shipped fast. I’m only part of the way through the book, but I want to share my opinions about this book and my progress. Trace image w/ 1 eye closed. While she can be quite wordy in why we have difficulty, the exercises she provides to help us overcome our disadvantage have a lot of merit. She starts off with some pre-instruction drawing, which will stay hidden in a vault until the end of time. 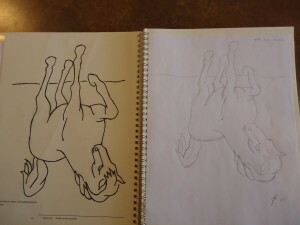 She uses something called “upside-down drawing”. Thankfully, we remain upright through the exercise, however the image we’re sketching is upside down. I was surprised by the results. While I can find and point out many places I wish I had done a better job, It’s the best drawing I’ve ever done. In fact, if I could have drawn like this my whole life, I wouldn’t have thought to turn to art self-help. I did two of the upside down drawings, and I’m impressed with both – it was a real confidence boost. Another exercise uses a picture pane with cross-hairs drawn onto it. I balanced my hand in a curled position and then traced my hand. This is teaching me how to take something 3 dimensional and turn it into something 2 dimensional. Then I made a sketch from the tracing. 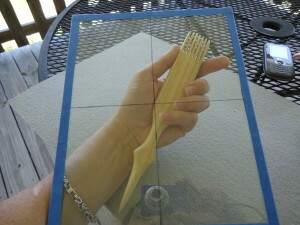 The next exercise is with the picture pane and includes holding something in your hand. I decided to hold one of my weaving combs, then I traced it (with one eye closed, no less). The sketch I made from that tracing also shows that I have a long way to go, but it’s so much better than I ever thought possible of myself. Next on the list of exercises, is drawing negative spaces. Negative space is something a weaver deals with all the time. When you draw the bottom line of a plate sitting on a table, you’re drawing the bottom of the plate, but also the table. That outline is shared by the plate and the table. 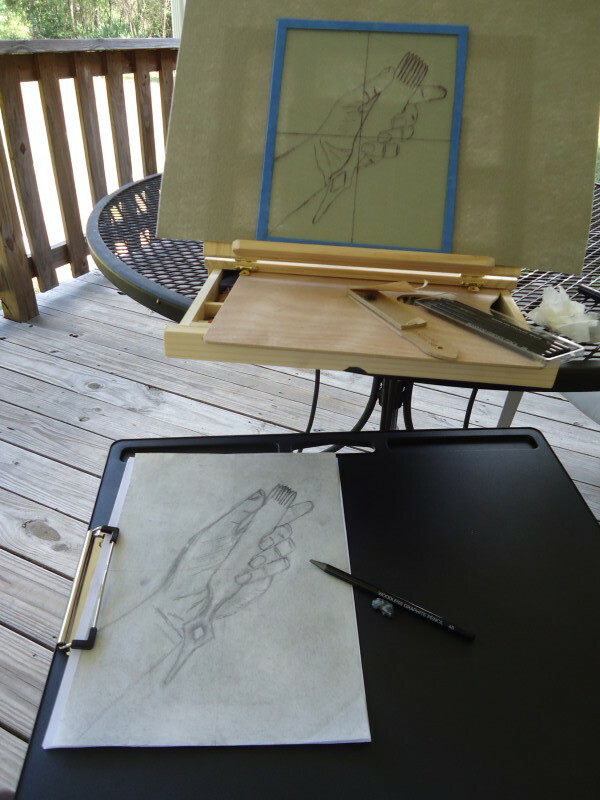 Sometimes drawing the negative space around the subject is easier than drawing the chair or person itself. Mrs. Edwards feels that the left side of the brain becomes engaged when we see familiar items the brain wants to label. It’s this left brain shift that makes it difficult to be creative and see what we need in order to draw well. Regardless of the reason, it does seem easier to draw the simple rectangles between the legs of a chair than to draw the legs themselves. We’ll see how this goes, I hope I have at least as much luck as I’ve had so far. This gives me the courage to take a workshop or class and hone these skills. I have no plans or goals on focusing my art in this area, but this skill is so useful in the art that I currently engage myself. 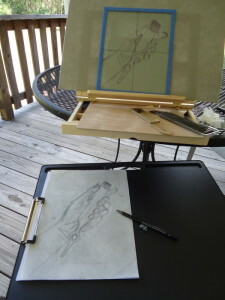 Meanwhile, I think I have all the art supplies I’ll ever need for this foray into drawing and sketching. Although, those beautiful colored pencils look awfully tempting.